Arctic Cycles – AMO+PDO corresponds to Arctic station group | Watts Up With That? Note: I tried to provide an excerpt for readers of this website Appinsys in the post there about Arctic cycles, but gave up. The website is written in MS-Word HTML export which is quite frankly the worst possible way to publish a website. The amount of garbage code it creates that makes it impractical for sharing and pretty much ruins the effectiveness of the website for others that want to reference it with excerpts. Trying to paste even short excerpts into WUWT’s WordPress publisher caused massive visual entropy. So, all I can manage is this sentence and image above. I hope he’ll take a cue from this and use a real publishing platform (WordPress, Blogger, Typepad, anything but MS-Word) designed for the web so we can help spread the word more often. Good works shouldn’t be saddled by bad web publishing systems. The AMO+PDO graph strikes again. It is a prime example of the adage “correlation does not mean causation”, because the AMO+PDO graph is meaningless. You can’t add the AMO and the PDO. I’ll cut and paste a comment I made on an earlier thread here at WUWT to save myself some time. May 22, 2011 in AMO, Arctic, PDO. So Hansen asserts that the previous warming cycle was natural (perhaps “solar forcing of the Arctic Oscillation”), but the current warming cycle is due to CO2. And yet the current “global” warming has also been “largely confined to the Arctic”. What is it that is supposed to made from this? The indexes correlate with arctic temps? They darn well better or someone is not doing their math correctly! The assumption (by some AGW skeptics) of course is that the cycle will repeat and we’re now going to see a period of cooling that would bring us back to previous baselines, wiping out the period of warming we’ve been through. As a side-effect of this period of cooling of course, the Arctic sea ice should begin to recover (according to Joe Bastardi et. al), and the whole thing will cycle back down. This is exactly why the next few years will be so interesting, as we are at a point where that cycling back down should begin in earnest. If it doesn’t, and we see 2010-2019 as warmer than 2000-2009, and then 2020-2029 as warmer on avergage than 2010-2019, and the arctic sea ice continues its long-term downward trend, what then my skeptical friends? Over where? Looks like something is missing. Or maybe the link belongs at the top of post. Is a puzzlement. Wyatt, M.G. ; Kravtsov, S.; & Tsonis, A.A. (2011). 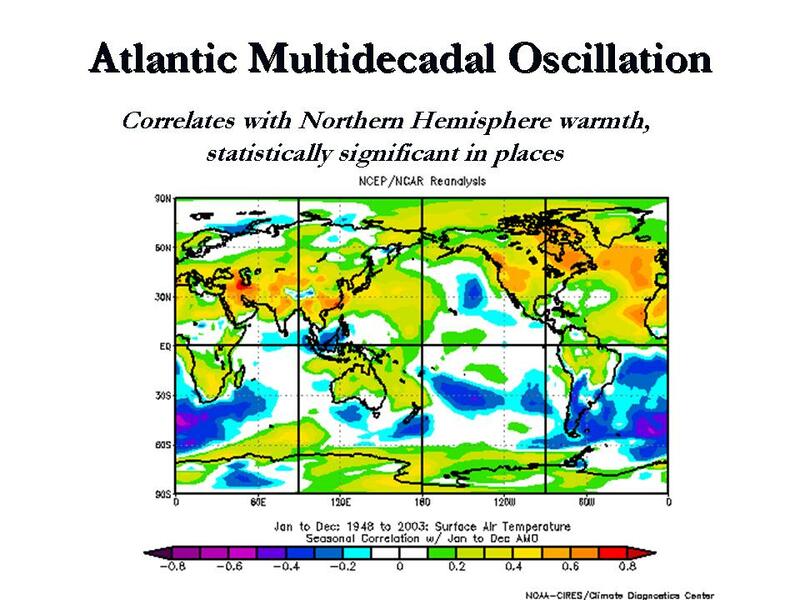 Atlantic Multidecadal Oscillation and Northern Hemisphere’s climate variability. Climate Dynamics. doi: 10.1007/s00382-011-1071-8. Not saying it’s perfect, but it does tie a “60 year bundle” that many WUWT readers might appreciate. I just wanted to ask the person who had rated this article at 1 star, why? What is wrong with this post? And what, if anything, is incorrect? I have no observations to the value of this article, but I hate trolls. I was the second person to rate it after some anonymous troll rated it 1 star. To me this post provides good clear information. If I knew it was wrong (like our anonymous troll apparently does!) I would have posted what I thought was wrong. Our gutless troll rated it 1 star. Ladies and Gents, please rate the posts when you have read them. The trolls are downgrading the ratings before anyone sensible is coming along. And probably before they have even cared to read the information contained. I noticed the graphs on the link show cooling starting before the first atomic bomb was set off. The reason I note this is that I read a post at wuwt a short while ago that implied the cooling seen from the 40’s to the 70’s was from atomic bomb testing. At the time, I thought that was a fair point. Now I think the paper that said that is wrong. You do realize that both PDO and AMO are essentially temperature indexes? … derived as the leading PC of monthly SST anomalies in the North Pacific Oceal, poleward of 20N. AMO index: the ten-year running mean of detrended Atlantic sea surface temperature anomaly (SSTA, °C) north of the equator. Indeed, we have shown (Hansen and Lebedeff, 1987) that temperature anomalies are strongly correlated out to distances of the order of 1000 km. For a more detailed discussion, see The Elusive Absolute Surface Air Temperature. Therefore it stands to reason that the arctic temperature would be correlated with temperature indexes from the North Atlantic and North Pacific. Well then, my skeptical friend we will have seen 20 years of more honest and accurate studies which will we have allowed us to continue our scientific endeavours to find the truth and put Hansen et al behind bars for ‘adjusting’ the data at a time when we needed to be more and better informed. If you have any suggestions for additional reasonably current and regularly updated graphs/graphics for inclusion on the Oceanic Oscillation Page, please post them below. I greatly admire that chart, and appreciate any additions. When the true trend line is shown, it becomes clear that there is no abnormal warming. Data is data. If the data goes as you suggest it might, then we will have to try and interpret what it means. I suppose it will mean that the warmaholics will have, at long last, some data to support their hypothesis. What then? That depends on what is going on in the Arctic vs Temperate Zones. If this is a zero-sum game, it spells natural disaster for the N. Hemisphere. Something that must be borne in mind: The Arctic vs the N.H. Temperate Zone, degree vs degree, latitude range vs latitude range, is not equal area. So, if the Arctic warms 2C, and the N. H. Temperate Zone cools 2C, the N.H. Subtropics remain neutral, then that is anything but a zero-sum game, and the N.Hemisphere has cooled. The false image of a hotter than ever Arctic (for which there was scant data) ploy by Hansens GISS was atrociously misleading. I agree. Once you use WordPress, it is really hard to use other platforms because WordPress (free) makes it so easy to build and maintain a web site. Scroll up to my May 22, 2011 at 1:18 pm comment. You can’t add the AMO+PDO, which means the graph is meaningless. Thanks Bob. I appreciate your input, as I already said I read this and came up a blank. The post seems ok, but you have corrected me and I will learn. But my comment still stands. There are a lot of anonymous trolls coming on this site rating the posts low, leaving no useful information as to why. Thanks for including the comment in the update, Anthony. What observational data exactly does support the CO2 AGW hypothesis? That would include the venerable tropical “hot spot”. Thus far the most common meme seems to be since it has warmed, CO2 increased, therefore CO2 is the cause of late 20th century warming. I think there is plenty of data to support the probabililty that AGW is occurring now, though, as I am only 75% convinced, so a bit more data would be nice. Here’s some more data for you. You’ll find this one a particularly compelling proof of the directly controlling influence of CO2 on global temperature from the palaeo record. Please note: the blue dots are the data. The red and orange lines are models. Hah! That’s what they said about Peanut Butter and Chocolate! And we all know where that went… Straight to my waistline. The AMO+PDO graph strikes again. It is a prime example of the adage “correlation does not mean causation”, because the AMO+PDO graph is meaningless. You can’t add the AMO and the PDO. Bob – why not? It would be a mistake if the aim were to prove some mechanistic linkage between the two oceans. But Anthony’s article was about the Arctic. The Atlantic and Pacific do have in common that they both interface with and (thus) influence the Arctic ocean. So in this sense, there is a rationale for merging the PDO and AMO indices and comparing them to Arctic ice – and the result is quite persuasive. if you want to capture something like this with a history from MS Word you can ‘wash’ it by pasting into a text only application such as MS Notepad, then instantly cut and paste it into WordPress – only the text will come though – none of the code. Granted you’ll need to embed the images manually, but at least you start with a clean sheet on the formatting. Okay, I don’t feel so bad about not understanding the post. I know more than when I came in. Onward to the next post! What’s the proof of CAGW? I get there might be some warming in the last few hundred years but, isn’t that to be expected? From MWP through the LIA to now the earth has been warm and cold at different times. 1. What makes anyone think this is different? 2. What optimum temp are we trying to achieve? 3. In order to reach this temp, do I have to sleep in the dirt and give up eating? will you be having a climate rapture party? until then, avoid committing pre-rapture crimes on the off chance that nobody will be accountable. Because the PDO is an abstract form of North Pacific Sea Surface Temperatures north of 20N. It does not represent the SST anomalies of that area. 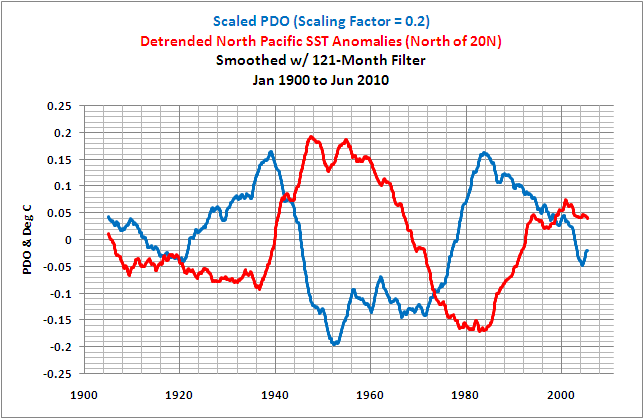 The PDO is actually inversely related to North Pacific SST anomalies. The AMO+PDO discussion should not pertain to that. I am curious, how narrow a definition of AGW are you using? Are you referring only to CO2 increase equals higher temperatures, or are you including amplification via feedbacks to that theory as well? The reason I ask is, CO2 increasing temperatures is well established, but the truth is without strong positive feedback it really does not matter. So are you 75% convinced of CO2 equals higher temperatures, or 75% convinced that CO2 equals higher temperatures plus strong feedback? Too many severe PDO misconceptions. Actually, it looks like Alan borrowed the PDO+AMO combination curve from Joe D’Aleo’s web site. I’m also pretty sure I’ve seen this PDO+AMO chart in one of Joe’s PDFs floating around the web. Possibly Joe can add some explanation here as to what he actually combined. Whatever Joe did, it might be a different than what either Alan or Bob thinks. The AMO+PDO thing is like a weed. Bob T. shall be forgiven if he inserts a few odd symbols in his response on one of these occassions. Several commentators have gone off-track on the “what if it keeps getting warmer” theme. If one thinks that a warming planet proves CAGW then you do not understand the issue. I think when looking at increasing CO2, you need to look at the whole system, and certainly that’s what the climate models try to do. Increasing CO2, by itself would produce only a very modest warming, even when going up several hundred ppm. But the positive feedbacks in the climate system are the ones worth looking very closely at, and certainly the negative feedbacks as well. My favorite positive feedbacks to increasing CO2 involve the polar regions. Increasing CO2 means just enough less ice to begin a slow downhill decline of sea ice. That is what all the GCM’s show and is exactly what is occurring. Less sea ice means more solar SW absorbed by the polar ocean means less sea ice means more SW aborbed. This all leads to a net warming of the polar regions, especially the N. pole first as it doesn’t have the large heat sink of the southern ocean like the S. pole does. Additionally, the warmer poles mean the melting of permafrost and the release of methane, which is even more potent of a GH gas, and though it last much shorter in the atmophere, when it breaks down it eventually becomes…CO2,. Polar amplifcation is happening now, is readily observed across the Arctic, and of course, skeptics love to try and say it has all happened before…which is true, but not for a very long time, and there is no known forcing now except for the increase in CO2 and related positive feebacks. I would ask the honest skeptic out there: What is the chance that the highest CO2 levels in 800,000 years (40% higher than we had as an average over that 800,000 year period) is not having some effect on the polar regions– specifically, for now, the N. pole? Doubling a trace gas does not automatically make that gas a significant component of the atmosphere. There is way too little CO2 to accomplish the AGW hypothetical. Analysing data is no substitute for empirical testing. Where are the CO2 controlled experiments that prove the heretofore unknown properties of this trace gas? You should be .075% convinced, for that is the proportional representation of doubling present levels of CO2. The AMO+PDO Arctic Temperature correlation is visually pleasing. Finding “temperature data” accurate to the TENTH of a degree C, dating back to 1880… HA HA! That’s a trip. Whoops, spelled it wrong. That’s a TRIPE. Garabage of the first order. What’s it based on? Bogus 018/O16 “temperature proxies”? Are the temps after 1945 from “land stations”. Do the bogus DEW LINE temps come into play? Thanks to Vukcevic for the graphics. I believe that the correct term is “first difference” rather than “first differential”. The former implies subtraction, while the latter implies division. To detrend time series the conventional approach is to subtract. If two resultants are inversely proportional, it is essentially the same thing as if they are directly proportional – except that whatever causes one to go up, causes the other to go down. In other words, the heat energy that goes into the El Niño apparently comes by taking that heat from the northern Pacific (by what mechanism I do not speculate), and vice versa for La Niña. I assume Bob has looked at the R-value for the out-of-phase? Maybe I am doing what Bob says we shouldn’t do – but I am pretty sure there is SOME link between PDO and ENSO, being in the same ocean and all. Perhaps not. But if not, where does the heat energy go when La Niña kicks in? And where does it come from when the El Niño does? That has always been my big question: El Niño is not a CAUSE, it is an effect, so where does all that energy derive from? I haven’t seen anyone address this question yet. They are both oscillations (PDO and ENSO), so it intuitively seems that the same excess of energy is simply oscillating to and from the Equator. Why? Claiming that CO2 rose from 280 PPM in 1880 to 380 PPM today and temperature rose about .6 ° C during that time proves that CO2 causes temperature rise is an obvious fallacy. It is like claiming that the hardness of the sidewalk in NY City rose from 1880 until today and temperature rose by .6 ° C therefore concrete hardness causes temperature rise is ridiculous. Although some concretes might have better heat retention qualities etc. No if the concrete got harder and softer 3 times or more and the temperature followed fairly closely there would be good reason to look for a link. They can and do cause alarmists to become alarmed. There have been 3 positive cycles of the El Nino/La Nina 2 since good records have been available. From 1940 to 1978 there is an overall downward trend in global temperature as measured by GISS. During that time there were about 14 La Nina’s and 3 El Nino’s and the temperature went down. No surprise there ! I might add that there was world war II when industry was pumping out CO2 by the ton. From 1978 to 1998 there was a preponderance of El Nino’s over La Nina’s 11 to 2 and the temperature went up. No surprise there and no CO2 is required to explain it. From 1998 to present is where it really gets interesting. In 1999 and 2000 and 2008 there were La Nina’s and between those dates there were El Nino’s and the temperature rose. The temperature resembles an inverted “U” with an up tick because of the El Nino in 2010. The objection is made that ocean cycles cannot explain the approximately ½ ° C overall warming per century and that is true but it can make temperatures appear to be warmer or cooler by quite a bit. In 1978 the alarmists became ….. alarmed because of the cooling since 1940. In 1998 the alarmists again became alarmed because of the natural warming since 1978. The cause of the overall warming is a moot point of interest only to climatologists and not worthy of economy destroying taxes. Since the warming began immediately after records were started at the end of the little ice age when CO2 production by humans was miniscule I doubt that it was the cause. In any case the warming is minimal and since we are at the top of the sine wave we will observe cooling for the next 20 to 30 years. While I agree that you’re adding apples and scaled oranges, you’re fundamentally looking for an entirely empirical model in the first place. If, iff something as direct as “Take AMO measured/calculated in this fashion, and PDO measured/calculated in that distinctly different fashion and add them” was posited and tested as an empirical model to predict future Arctic average temperatures (even just a year in advance), the only real question is: Does it work repeatedly? But it is possible to find useful empirical models before one has even a solid grasp on what, in theory, is going on. And based off of data that is itself on a poor proxy or a secondary effect. But to do so you have to fundamentally dump the idea of just “finding correlations” and start from the framework of having just 2/3 of the actual data (so you have something to test on). All the various scaling and shifting is then part of the model as opposed to an all-data best-case-correlation. Discovering that your scaled orange is actually close to being an upside-down apple can be a good thing. IOW: Try AMO minus scaled-North-Pacific-via-SST. …where SCL’ = rate of change of solar cycle length = solar cycle deceleration ….not to be confused with solar cycle length, which has a correlation of almost zero with SCL’ (…which shouldn’t come as a surprise to anyone who understands complex [as in complex numbers, not as in complicated] phase relations). Summers/winters occur in opposite hemispheres every 6 months (semi-annual). The solar cycle controls how hard the semi-annual heat-pump pumps. The spacing of clusters of higher-intensity pumping-episodes affects the distribution & state of water [including ice] on the planet. Interannual spatiotemporal chaos (including ENSO) throws something into the mix that makes it difficult or impossible for the mainstream to see the preceding simplicity using LINEAR methods. Vuk’s comment captured part one of the main points in my posting – there are repeated, nearly identical, cycles and Hansen says the previous one is natural but the current one is CO2. There is one simple method, how to identify the greenhouse fingerprint in the Arctic; winters should warm much more than summers. It is not the case. No hotspot, no humidity feedback, no polar fingerprint, no more El Ninos, no warmer winters, NOTHING. Just powerful models. The Pacific Warm Pool furnishes the warm water for an El Nino. Some of that supply of warm water in the Pacific Warm Pool is leftover subsurface warm water from the preceding El Nino that has been returned to the west via Rossby Waves at about 10N and 10S during the La Nina. Add to that, some of the warm water supply comes from the preceding El Nino when the leftover warm surface waters are pushed back to the west by the strong trade winds of the La Nina. And some of the warm water supply is created during the La Nina by the stronger-than-normal trade winds reducing cloud cover and allowing Downward Shortwave Radiation to warm the waters. There is, but the PDO pattern is an aftereffect of ENSO. The warm water in the northeastern Pacific (an indicator of a positive PDO) is created by changes in atmospheric circulation caused by an El Nino and through coastally trapped Kelvin Waves. As described above, that warm water is returned to the west during the La Nina. Some of the leftover warm water gets spun up into Kuroshio-Oyashio Extension east of Japan. That creates the warming of the western and central North Pacific that’s associated with the negative PDO pattern. And of course, the northeast Pacific cools during the La Nina. The PDO pattern is also affected by the Sea Level Pressure of the North Pacific, which alters how ENSO events impact the Sea Surface Temperatures there. Does the leftover warm water from the El Nino that was spun up into the northwest and central North Pacific during the La Nina eventually feed back to the tropics? Yup. The North Pacific gyre would assure that, and there’s also mid-depth meridional overturning circulation in the North Pacific that would return some of the warm water to the tropics via subsurface routes. But those are not functions of the PDO. ENSO is the cause. I’ve addressed it in posts at my blog for a couple of years. Many have been cross posted here at WUWT. Personally, I think we’d be better off presenting the PDO the same way as the AMO, and that is by detrending North Pacific SST anomalies north of 20N. We should be more interested in the temperature of the North Pacific than in the pattern (appearance) of the temperature anomalies there. The PDO is useful, but not as an indicator of the sea surface temperature of the North Pacific. I think we’re dealing with this all wrong. Bob points to an almost inverse relationship between the heat distribution in the North Pacific and the North Atlantic, this I believe is the essence of what’s going on with the cycles that are roughly 70 years in length (35 up, 35 down give and take). Land heat distrubution is fairly seasonal (because it loses heat fast), so is the ocean, but the ocean stores a lot of energy, which gives us cycles of heat distrubution, which are not primarily seasonal. I suggest that the distribution of heat in the ocean determines polar cell meandering especially in winter. I also suggest that lower and higher pressures are pushed across the Arctic in response to this ocean heat distrubution, because the massive lows over the ocean expands the atmosphere pushing surrounding air masses away. Such shifts in atmospheric behavior determined by ocean heat distrubution works back on the ocean via the atmosphere to again change the heat distribution. In essence, what we should be contemplating is a giant shuffling mach in which low pressure systems expand and moves the polar cell and prevents the vortex from transporting high level air to the surface in one region, and as a consequence forcing it to strike down in another region. The arctic dicotomy, I call it. For instance: if there is massive cyclonic activity in the North Pacific and these cyclones wander into Northern Canada all the way to Hudson bay and the disco bay, then if cyclone activity is weak in the Barents sea and the norwegian sea, the vortex will more readilly touch ground in these areas: Iceland and Scandinavia and Siberia producing blocking highs. This will change conditions and on average change the oceanic flow. More blocking over the Scandinavian Icelandic region will push more warm water from the Golf Stream into the Labrador Sea, Disco Bay, Hudson bay and the Canadian Archipilago. 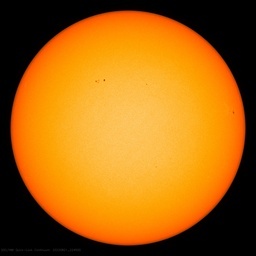 I think the rhythm of the sun has much to do with these changes, and it is even possible, that these flow changes in the ocean can agrevate vulcanic eruptions and earth quakes. Might even modulate to some small extent the magnetic field of the earth itself. I asked Joe D’Aleo about this a couple of years ago and he was kind enough to email me a copy of his spreadsheet. He standarized the AMO data from the ESRL website, and added it to the PDO data from JISAO, which is already standardized. But the AMO data is North Atlantic SST anomaly data that has been detrended, and the PDO data is the first principal component of detrended North Pacific SST anomalies. One represents Sea Surface Temperature anomalies and the other represents the pattern (appearance) of the Sea Surface Temperature anomalies. Since the intent is to illustrate a naturally caused, sea surface temperature-based explanation for Arctic land surface temperature anomalies, why not simply start with the actual SST anomalies of the North Pacific and North Atlantic, north of a specific latitude? SST data is readily available through the KNMI Climate Explorer, and so is Land Surface Temperature data. The KNMI Climate Explorer even creates correlation maps, so anyone could start with the Arctic Land Surface Temperatures and see which areas of the North Pacific and North Atlantic actually correlate with them. Juraj V. says: “There is one simple method, how to identify the greenhouse fingerprint in the Arctic; winters should warm much more than summers. Juraj V., your graph appears to contradict you. The Dec-Feb anomalies appear to have risen more than Jun-Aug anomalies. Maybe a graph that compares the two would help confirm or contradict your statements. “Detrending” is being used a lot in this post. To “detrend” a monthly observation dataset, does one do the following? 1. Add up all the monthly observations. 2. Determine the average from the sum in #1. 3. Subtract the monthly observations from the average determined in #2. 4. Plot the differences determined in #3 and that provides a “detrended” curve. If the above is incorrect, Bob, could you provide a simple explanation of how one detrends a monthly dataset? Anyone? Is “detrending” another way of saying “normalizing” or “standardizing”? Anyone or Bob. December anomalies and trend since 1928. 1) In general (I can think of a few exceptions such as reaching a lay audience with easy-to-follow illustrations), nevermind linear detrending. 2) Measures of spatial pattern have utility, so instead of suggesting what we should be “more interested in” (e.g. PMO) I would rather caution that we should be “more careful about how we interpret summaries” (PDO vs. PMO or whatever). This is the core difference between attempting to “find a correlation/explanation” and trying to “find an empirical model”. If it doesn’t, and we see 2010-2019 as warmer than 2000-2009, and then 2020-2029 as warmer on avergage than 2010-2019, and the arctic sea ice continues its long-term downward trend, what then my skeptical friends? If all this is observed, we still need some actual evidence that CO2 is the cause. We need evidence from people that are open to FOI requests and aren’t trying to push an agenda. We need science journals that aren’t taken over for political purposes. We need science journals that require release of data. We need honest science rather than fraudulant piecing together of a graph from disparate sources to defend sketchy proxies. We need a lot more evidence that includes better understanding of clouds, oceans, and a whole lot more. We need climate models that get back casts of rainfall correct as well as temperatures. If CO2 is the cause, then show it and don’t hide behind anything. That’s what we need. There’s nothing wrong with mixing PDO & AMO in an empirical model – someone with a good handle on spatiotemporal dynamics might even successfully defend such a model on physical grounds – but there is something FUNDAMENTALLY WRONG with perceiving PDO as analogous to AMO (which far too many erroneously do). Solar max interrupts the semi-annual heat pump. The frequency of pump outages controls multidecadal oscillations (via hydrology). Interannual spatiotemporal chaos makes this difficult or impossible to see using LINEAR methods. That makes so much common sense it hurts. That way you have apples to apples. Isn’t the issue then how you CAN correlate relevant inter-decadal temperature indices (which both PDO and AMO are) with actual temperature graphs? Because presumably the point of doing so is saying ‘there is some component of the future in the past data’ (which presumably is an indication of oceanic heat content absorbed in the past feeding into future temperature)? I’ll leave the technical decisions to the experts, but if my logic is wrong, will someone please explain why and what logic would be better? What is the difference between PDO & North Pacific SST? I notice you are putting a heck of a lot of store in the Artic ice levels as they stand today. In fact you go so far as to say that such low levels have not been seen for ‘a long time’. But…thats just not true is it, be honest. The Artic ice levels in the 20s/30s was just as low as it is today……this is evidenced by the many photographs and reports at the time. You cannot have missed the ‘disapearing island’ stories or the ice free shipping routes from that era…for sure it was hardly the Caribbean, and it was only a few ships for a short time of the year, but overall, a 20-30yr period where ice cover was most likely less than it is today…because today we cannot even achieve those shipping routes, and that inconveniant little island is still today joined by an ice bridge. If you can agree on that, then your arguement ref CO2 stands on its head….increasing CO2 levels have failed (all other inputs being static…and after all we are ‘told’ it cannot be Enso/GCR/TSI by you guys..heh!) to melt the ice any further than it was 70yrs ago. Same arguement goes for Manns hockey stick….if we agree, as seems likely now (do you accept this?) that the MWP was at least as warm as it is today AND globaly, then increases of CO2 by 30% since that time have failed totally to melt the ice or warm the earth at all. Or….there is certainly no postive feedback from CO2. I find your arguements on the artic rather self defeating. But then…I guess every other part of the theory has not played out – no tropho hotspot/kinda kills the reasoning for the strato cooling/no real sea rise increase rate. Al there is left is the Artic to hang the hopes on. We could of course have several hundred years of very very low, ice free waters in the Artic from now on, just like during the MWP (which..to labour the point…had nothing to do with CO2..) and it would prove absolutely zilch as far as causation is concerned. Do you not think you are hanging too much on sea ice?